On this Claves album, featuring a Serenade each from Mozart and Schoeck, the press information highlights how both composers were only twenty years old at the time of composition and how one hundred and thirty years separates the two works. This fascinating programme is played by the Musikkollegium Winterthur, a forty or so strong ensemble here, directed from the violin by Roberto González Monjas. Mozart composed a considerable number of works classed as ‘entertainment music’ intended often for outdoor entertainment on social occasions, not for serious performance in the concert hall, church or recital room. This ‘entertainment music’ in Mozart’s output took several forms such as, orchestral music, small chamber groups and often wind ensembles. Even if the objective of the work was for other than concert purposes Mozart took the modest ambition of the genre very seriously and I believe great inspiration can be found in some of these scores such as the Serenade No. 10, K361 ‘Gran Partita’; a masterwork of the genre. Mozart composed his Serenade No. 7, K250 known as ‘Haffner’ in 1776 in response to a commission by the composer’s friend Sigmund Haffner the younger, son of the Bürgermeister of Salzburg, who wanted a serenade for the wedding festivities of his sister Marie Elisabeth. Musicologist H.C. Robbins Landon described the score in glowing terms as “Mozart's first great orchestral work - that is, the first in which technical ability and musical genius are perfectly wedded.” Musikkollegium Winterthur is very much at home with Mozart’s lively writing, which it emphasises, playing with real verve and a strong sense of spontaneity that never comes at the expense of unity. Directing from the violin Monjas’s solo contributions are quite excellent. For those wanting to hear more of Mozart’s Serenades (including the celebrated ‘Gran Partita’) and Divertimenti for wind ensemble I can heartily recommend a recording on period instruments from Amadeus Winds conducted by Christopher Hogwood recorded in 1985/89 in New York and Boston on Decca. Described by music writer Mark Morris as “one of the neglected minor masters of twentieth century music” Othmar Schoeck in his early period was writing looking back as the sun was setting on Romanticism. Written in 1906/07 Schoeck’s rather brief Serenade for small orchestra, his official opus one, was for a short time known by the sobriquet of Spanish Serenade. Strongly influenced by Hugo Wolf’s Italian Serenade from almost fifteen years earlier Schoeck introduced his own Serenade as an examination piece during a student concert at Zürich Conservatory where he was a pupil. Around eight years later, at the suggestion of his then teacher Max Reger, Schoeck undertook some revisions to the score notably adding a second bassoon and timpani to the closing section. It’s certainly an ambitious and worthy work for a student, which undoubtedly makes its presence felt. Striking for its exuberance and joyous sense of fun this engaging performance aptly reveals the composer’s polished compositional facility. Recorded at Stadthaus Winterthur there are no problems at all with the sound quality which is reasonably warm, clear and well balanced. The interesting essay in the booklet is taken from an interview that musicologist Ronny Dietrich held with Roberto González Monjas. 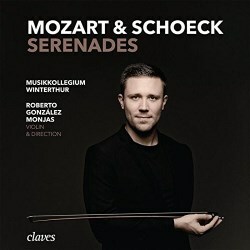 This rewarding album on Claves comprises of two Serenades, one from Mozart and another from the much lesser known Schoeck, yet both works provide light hearted enjoyment in spades.